The risk for anesthesia-related complications or death does not end when the vaporizer dial is turned off. In fact, it can be argued that the greatest risk occurs during the recovery period. Equal vigilance is required during anesthetic recovery. Recovery from anesthesia begins the moment that inhalant or intravenous anesthetics are discontinued. Generally speaking, recovery will last until the patient is extubated and able to be left unattended in its kennel. Patient recovery should ideally be quick, smooth and stress-free. Sometimes this is the case, but there are times that recovery from anesthesia can last an hour or longer. Species, breed, temperature, degree of illness or comorbidities, and anesthetic drugs can all play a role in recovery time. Oxygen supplementation should be provided for several minutes after turning off the inhalant (table 1). This will dilute the inhalant and speed up the recovery process, allow for scavenging of exhaled waste anesthetic gas, and aid in avoiding hypoxemia as the patient begins to ventilate normally. Respiratory arrest is a preventable post-anesthetic complication often caused by poor positioning (airway obstruction, neck position, excessive bedding) and lack of monitoring following extubation. Post-operative hypoxemia is a frequent complication discussed in the human medical profession. The patient, who has been receiving nearly 100% O2, is disconnected from the anesthesia machine and begins breathing room air (21% O2). Desaturation occurs quickly, sometimes waxing and waning unbeknownst to the anesthetist or nurse. Ideally, ETCO2 and SpO2 monitors remain connected in the immediate recovery period to evaluate ventilation and oxygenation and the need for continued O2 supplementation. Once O2 supplementation has been discontinued and SpO2 is stable (>95% on room air), the patient is ready for transport. Ideally, patients should be allowed to recover in a quiet location with easy access to emergency supplies and personnel. The endotracheal tube (ETT) should remain secure and the cuff inflated until transport is complete and extubation is imminent. 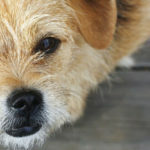 For dogs, extubation typically takes place when the patient is swallowing and showing other signs of wakefulness (moving limbs, strong palpebral reflex, trying to lift head). To prevent sudden biting of the ETT during an unexpectedly quick recovery, the anesthetist can hold the tongue to one side of the patient’s mouth. With a gentle grip on the tongue and hand on the snout, one will be able to extubate quickly if needed. For cats, delayed extubation may result in laryngospasm. Cats are typically extubated with fewer signs of wakefulness (maybe swallowing, licking, moving limbs). In either species, do not delay extubation to provide O2 supplementation or arrive at the final recovery area if the patient is showing signs of wakefulness sooner (table 2). In cases where the procedure has caused fluid to potentially accumulate in the oropharynx (oral surgery, perhaps dental procedures) or the patient has regurgitated, the ETT should be removed with the cuff slightly inflated. This will pull fluid out of the oropharynx along with the ETT and prevent the fluid from passing into the trachea. What happens if the patient chews the ETT? If the ETT is completely chewed in half, try to recover it immediately. Sedation may be necessary to safely reach into the patient’s mouth. If the ETT cannot be retrieved by hand, O2 supplementation should immediately be started, and the patient should be re-anesthetized. An ETT of a smaller diameter is inserted into the remaining portion of the existing ETT, and the new cuff is inflated. When the new ETT is removed, it should pull the chewed ETT out as well. If this is unsuccessful, bronchoscopy or surgery may be needed. What happens if I cannot remove the ETT? This occasionally happens with the silicone low-volume, high-pressure cuffed ETTs. The cuff essentially acts as a vacuum against the lining of the trachea. As long as the cuff is deflated, gently insert the ETT and rotate slightly. Alternatively, the cuff can be gently inflated slightly and then deflated. The ETT should then easily be removed. The majority of our anesthetics can predispose a patient to gastroesophageal reflux (GER) and regurgitation. If a patient regurgitates, there is an increased risk of aspiration of reflux into the lungs. There is also a risk of the patient developing esophagitis and esophageal stricture due to the high acidity of gastric contents. If regurgitation occurs during surgery, first ensure that the ETT cuff is inflated appropriately (Close the pop-off valve and listen as a breath is delivered. While a breath is being given, inflate air into the ETT pilot if needed until pressure holds at 20cmH2O and no leak is heard. NOTE: a leak should still be heard at 30cmH2O to prevent over-inflation. Remember to open the pop-off valve.). The patient’s mouth and oropharynx can easily be suctioned using a red rubber catheter. The mouth and esophagus should be flushed with warm water and suctioned again until clear. The patient will need close monitoring during recovery to watch for further regurgitation. 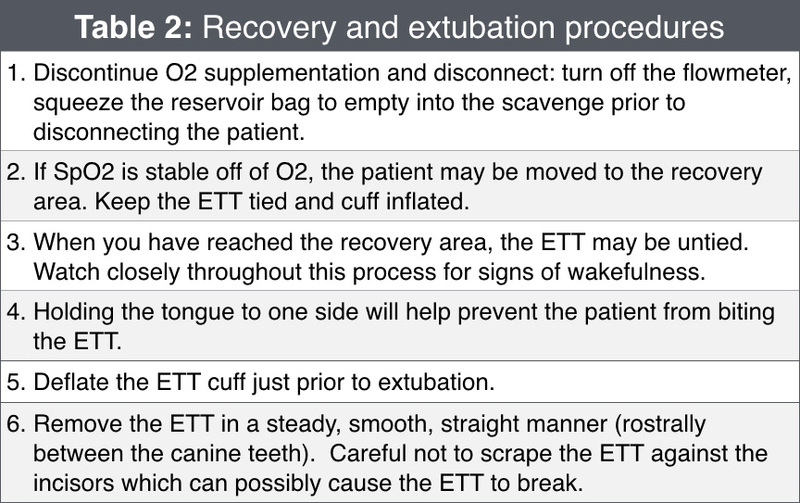 If regurgitation occurs during recovery before extubation, again ensure the ETT cuff is inflated. The patient’s head should be allowed to hang off of the table or gurney. Suctioning and flushing should be attempted, but is tricky if the patient is recovering quickly. Extubation in a rousing patient should not be delayed to perform these procedures, but the ETT should still be removed with the cuff inflated slightly. Brachycephalic breeds (including Persian cats, Boston terriers, pugs, and bulldogs just to name a few) are predisposed to prolonged recoveries. This is not to say that they take a prolonged time to emerge from anesthesia, but they do tend to be slower to extubate than other breeds. Due to elongated soft palates, stenotic nares, and hypoplastic tracheas, brachycephalic breeds often enjoy keeping their endotracheal tubes in place for the simple sake of breathing easier! It is important to allow a brachycephalic patient to keep its ETT until he shows multiple signs of awareness – able to hold head up, swallowing, trying to chew on the ETT, able to sit up unassisted. A small exception to this may be with brachycephalic cats. While we do ensure that they are fully awake before extubation, delaying extubation in cats can lead to laryngospasm, which in an already somewhat compromised airway could lead to obstruction. Following extubation, close observation of the patient is important to ensure he is still breathing comfortably and without effort. Occasionally, a brachycephalic patient will need to be re-intubated if he shows signs of distress. If heat support is being provided post-operatively, especially close monitoring is needed to watch for signs of overheating and excessive panting. What is a prolonged recovery? With today’s use of multi-modal anesthesia and analgesia, it’s no wonder many patients tend to stay asleep a little longer. That being said, there are contributing factors that can lead to a prolonged recovery. Hypothermia, for example, can lead to decreased anesthetic requirements, decreased metabolism of anesthetic drugs and bradycardia – all of which can delay recovery. Has the patient been receiving an opioid constant rate infusion (CRI) or received an opioid bolus just before cessation of anesthesia? Opioid administration can also cause a delay in recovery. Generally speaking, if there are no signs of rousing 20-30 minutes following discontinuation of anesthesia (and the patient is normo- or nearly normothermic) reversal agents may be considered. We do have to consider the need for appropriate analgesia even during a prolonged recovery. Rapid and complete opioid reversal can lead to sudden pain, distress, tachycardia, and hypertension. Be cautious when using stimulation techniques as a sole method of facilitating extubation (pulling the tongue, moving limbs, changing patient position). While this may allow for a more rapid extubation, the patient is likely to remain sedate and may not be able to protect his airway once stimulation has ceased. We should be sure that the patient is showing multiple signs of stirring before extubating. If it has been determined that the recovery is prolonged, a reversal agent may be administered. Naloxone is a full opioid antagonist and will completely reverse the effects of drugs like morphine, hydromorphone, and fentanyl. In reversing these drugs, it also will reverse analgesia. It is extremely important to preserve analgesia during the recovery process and titrate naloxone slowly as to achieve the desired effect. While a dose of 0.04mg/kg is recommended as part of an emergency treatment protocol, 0.02mg/kg titrated IV slowly and to effect is recommended to partially reverse opioids in the face of a prolonged recovery. The patient must still be monitored closely for signs of re-sedation as the duration of the opioid may be longer than that of the naloxone. Perhaps a more favorable reversal technique is to use an agonist-antagonist opioid. Diluted Butorphanol 0.05-0.1mg/kg can be administered slowly IV to effect. This will partially reverse mu-agonist opioids while still preserving analgesia. Flumazenil is a benzodiazepine reversal agent. A dose of 0.02mg/kg given IV is usually sufficient to reverse any excessive sedative effects of midazolam or diazepam. The dose can be repeated if a patient becomes re-sedated. Caution should be exhibited in patients predisposed to seizures. Atipamezole (Antisedan®) is an alpha2 antagonist used to reverse the effects of dexmedetomidine. Antisedan® is formulated such that the volume delivered equals that of the dexmedetomidine administered (i.e., 0.2ml of dexmedetomidine would be reversed with 0.2ml of Antisedan®). Antisedan® is given intramuscularly regardless of the route of dexmedetomidine. Rapid intravenous administration is contraindicated, and its slow IV use is reserved for true emergency situations. An all too familiar scenario: the patient emerges from anesthesia as you’re transporting him on a gurney, eyes open wide, the mouth opens and closes but no sound comes out – until you pull the endotracheal tube that is! And then it’s all hands on deck as someone restrains the pet, another holds the IV catheter and a third person injects a sedative – does anyone have a flush?! When faced with a patient experiencing a rough recovery, it is the anesthetist’s responsibility to quickly differentiate between pain and other sources of agitation. Easier said than done when you’re trying to keep a patient from launching himself off of the OR table. Pain, dysphoria, and emergence delirium are three reasons we can see a rough recovery. Pain can be evaluated in a recovering patient by gently palpating the affected surgical area. For example, following stifle surgery the incision can be palpated, along with gentle flexing and extending the stifle. In an extremely agitated patient, this may be difficult to assess, and analgesics should not be withheld. In addition to an opioid, a low dose of a sedative can be added. Dexmedetomidine (0.5-2mcg/kg) or acepromazine (0.01-0.02mg/kg) can be added to an analgesic to calm the patient. In contrast from opioid-induced prolonged recoveries, we have also seen an increase in opioid-induced dysphoric recoveries. Today we are utilizing opioids during every stage of anesthesia. We premedicate with an opioid, use CRIs and/or give bolus doses of an opioid intra-operatively. Maybe an opioid was given just before the completion of surgery. If all of these are the case, we may assume in that instance that pain is not the cause of this post-anesthetic agitation. Dysphoria is the likely culprit, and sedation is used to resolve the initial predicament. Small doses of either dexmedetomidine (0.5-2mcg/kg) or acepromazine (0.01-0.02mg/kg) IV will generally improve the situation. With dysphoria, administration of an opioid has the potential to make the situation worse. Patients experiencing this condition will not be aware of their surroundings and will not calm down with (or even be aware of) human contact. If administration of a sedative does not work partially reversing the opioid should help. A low dose of butorphanol (0.05-0.1mg/kg IV) will be telling enough if this is opioid-induced dysphoria. In one study, the recent and more frequent use of opioids resulted in an increased “requirement for pharmacological intervention for apparent distress during recovery from anesthesia.” Some patients may experience emergence delirium or an explosive, agitated emergence from anesthesia. We tend to see this when ketamine has been used just before recovery, it has been used for a short procedure, or when other sedatives have been metabolized and are worn off. If the patient does not immediately settle down, an analgesic combined with a sedative may be given. If the delirium is severe, administer a small dose of induction agent (propofol or alfaxalone – not ketamine +/- benzodiazepine) and allow the patient to “re-emerge” more slowly. In many cases, careful pre-anesthetic evaluation of the patient can predict how that patient will recover. If the pet is very agitated and anxious before the administration of any drugs, it is likely that he/she will experience some form of a rough recovery. There can be some breed predictions as well: Northern breeds and sighthounds are some that may be likely to experience a rough anesthetic recovery. It is best to plan for these circumstances and have post-operative drugs on hand before recovery. Becker, WM., Mama, KR., Rao, S., et al. Prevalence of dysphoria after fentanyl in dogs undergoing stifle surgery. Veterinary Surgery 42(3): 302-307, 2013. Bryant, Susan. 2010. 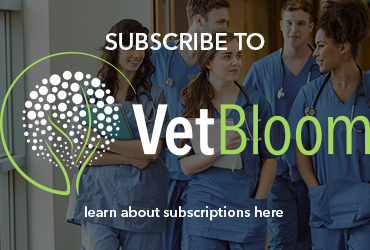 Anesthesia for Veterinary Technicians. Wiley-Blackwell. pp 159-166. Grim, K., Tranquilli, W., and Lamont, L. 2011. Essentials of Small Animal Anesthesia and Analgesia. 2nd Ed. Wiley-Blackwell. pp 47-48; 286-288. Hoffmeister, EH., Herrington, JL., Mazzaferro, EM. Opioid dysphoria in three dogs. Journal of Veterinary Emergency and Critical Care 16(1): 44-49, 2006. Sun, Z., Sessler, DI., Dalton, JE., et al. Postoperative hypoxemia is common and persistent: A prospective blinded observational study. Anesthesia and Analgesia 121(3): pp709-715, 2015. 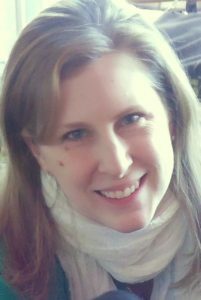 Jaime has been working as a certified veterinary technician for over 15 years. She is an active member of the Academy of Veterinary Technician Anesthetists and the Academy of Veterinary Emergency and Critical Care Technicians, through which she is recognized globally as a veterinary technician specialist in both anesthesia and emergency/critical care. Training and education are near and dear to Jaime’s heart, providing skilled and practical guidance as an anesthesia and ECC trainer, consultant and speaker. She is also a published author in ECC and anesthesia-related topics. In addition to working as a surgery and anesthesia technician at the Massachusetts Veterinary Referral Hospital, Jaime is also an instructor for Manchester Community College’s veterinary assistant course, getting back to basics for those interested in pursuing a career in veterinary nursing.